È il primo volume della nuova pubblicazione scientifica di WBA “Memoirs on Biodiversity”: 14 generi, 2 sottogeneri, 285 specie e 3 sottospecie nuove per la Scienza descritte da 28 tassonomi in 19 lavori scientifici, rappresentano il primo contributo della World Biodiversity Association onlus alla conoscenza della biodiversità del Sud America. *Autori:Allegro Gianni, Ballerio Alberto, Bartolozzi Luca, Battiston Roberto, Bellò Cesare, Boano Giovanni, Buzzetti Filippo Maria, Carotti Giovanni, Casale Achille, Constantin Robert, Daccordi Mauro, Silvano Fabrizio, Giachino Pier Mauro, Gill Bruce D., Janni Ottavio, Moret Pierre, Onore Giovanni, Osella Giuseppe, Pace Roberto, Pavia Marco, Picciau Luca, Proaño Castro Carolina, Rigato Fabrizio, Rossi Walter, Salgado José Maria, Scupola Antonio, Toledano Luca, Vigna Taglianti Augusto. On the 4th of October 2004, in the Museum of Natural History of Verona, a group of enthusiastic naturalists founded the World Biodiversity Association onlus. Expectations and aspirations that always accompany those who meet to achieve shared goals, were directed primarily to the realization of naturalistic expeditions to the biodiversity hot-spots, contributing actively to the inventory of biological richness of our planet, that is increasingly threatened. This association, in fact, has two main mission, the first one, “Discovering Biodiversity”, namely censusing biodiversity through naturalistic expeditions to the areas where it is higher; the second mission, “Conservation by Education”, aims to protect biodiversity through education. In order to be effective, conservation must be based on knowledge, but also on a capillary educational activity, aimed in particular to the younger generation: teaching diversity, tolerance, the right to life for all organisms, and the respect of the natural balance. During the first years of its activity the WBA onlus has promoted several initiatives aimed at the pursuit of both missions; in particular, it has undertaken the organization of naturalistic expeditions to some natural biodiversity hot-spots and the support of the Biodiversity Project, by organizing the annual “ Biodiversity Day” and by purchasing a few tens of hectares of tropical rainforest in Ecuador. In its activities the WBA onlus is supported by a Scientific Committee consisting of academics, botanists, and zoologists. However, on 4th October 2004 none of the nine WBA founding members imagined that in such a short time the activity of the new association would have led to the creation of a book like that which I have the honour of presenting. It represents the effort of a group of people with strong motivations in achieving the objectives described above, starting from our founding member prof. Giovanni Onore, director of the Museum of Quito and Chairman of Fundacion Otonga, which has supported us in the naturalistic expeditions in South America and has enabled us to collect a lot of biologic material in various environments in Ecuador. It must be said to this purpose, that the over 280 new species described in this book are only a part of this material, that is preserved in the collections of the Museum of Natural History in Verona. The largest effort of our Association was really to finalize the research through the study of the collected material by specialists. Many of the taxonomists involved in this work, engaged in research institutes, universities and museums, have become members of the Association, offering their free work to publish the data of our research. Some of them have also participated in the field research, thus resulting at the same time as collectors and descriptors of the newly discovered species. The publication of the data has been possible mainly due to their help, as well as to the support of WBA members who welcomed enthusiastically the proposal to create a new scientific journal. 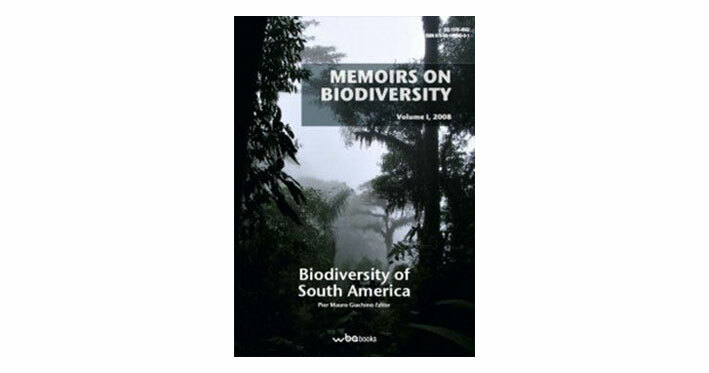 A special thank goes to Dr. Pier Mauro Giachino, coordinator of the WBA Scientific Committee and editor of this book, for having shared with me the dream of a WBA scientific publication; his contribution and his experience have been fundamental, also in the choice of name: “Memoirs on Biodiversity”, which will be issued yearly. This journal also wants to represent a stimulus for the scientific world to provide better responses to the biodiversity emergencies and to propose suitable systems for a reduction in the loss rate. It is no longer the time for words and proclamations, it is time to act… before it is too late. PROAÑO CASTRO A. C., ROSSI W., 2008 – New records of Laboulbeniales (Fungi, Ascomycota) from Ecuador. pp. 11-18. BATTISTON R., PICCIAU L., 2008 – Contribution to the knowledge of the Mantodea of Ecuador with the description of the male of Pseudoxyops perpulchra (Westwood, 1889). (Mantodea Mantidae Stagmatopterinae). pp. 19-30. BATTISTON R., PICCIAU L., 2008 – First report of the praying mantis genus Musoniella Giglio-Tos, 1916 from Ecuador with the description of a new species. (Mantodea Thespidae Thespinae). pp. 31-38. BUZZETTI F. M., CAROTTI G., 2008 – Annotated list of the Caelifera of Ecuador (Insecta: Orthoptera). pp. 39-66. VIGNA TAGLIANTI A., 2008 – A new species of Esphalmenus from the Great Andes of the Ecuador (Dermaptera, Pygidicranidae). pp. 67-75. VIGNA TAGLIANTI A., TOLEDANO L., 2008 – Bembidion (Ecuadion) agonoides n.sp. from Ecuador (Coleoptera, Carabidae, Bembidiina). pp. 77-80. TOLEDANO L., 2008 – Systematic notes on the Bembidiina of the Northern Andes with particular reference to the fauna of Ecuador. (Coleoptera, Carabidae). pp. 81-130. ALLEGRO G., GIACHINO P. M., SCIAKY R., 2008 – Notes on some Trechini (Coleoptera Carabidae) of South America with description of new species from Chile, Ecuador and Peru. pp. 131-171. CASALE A., 2008 – The genus Calleida Dejean 1825 in Ecuador (Coleoptera: Carabidae: Lebiini), with eight new species. pp. 173-193. GIACHINO P. M., MORET P., PICCIAU L., 2008 – A new microphthalmous species of Perigona Castelnau 1835 from Ecuador (Coleoptera Carabidae). pp. 195-199. MORET P., 2008 – Four new species of Diploharpus Chaudoir 1850 from Ecuador (Coleoptera, Carabidae, Perigonini). pp. 201-208. SALGADO J. Mª, 2008 – Contribution to the knowledge of the biodiversity of Ecuador: new genus, new species and new records (Coleoptera, Leiodidae, Cholevinae). pp. 209-223. PACE R., 2008 – New records of Aleocharinae from Ecuador and Peru, with the description of new species, new subgenera and new genera (Coleoptera, Staphylinidae). pp. 225-398. ONORE G., BARTOLOZZI L., 2008 – Description of the larvae of Sphaenognathus (Chiasognathinus) gaujoni (Oberthür, 1885) and S. (C.) xerophilus Bartolozzi & Onore, 2006 (Coleoptera: Lucanidae), with observations about their altitudinal range extension. pp. 399-406. BALLERIO A., GILL B. D., 2008 – Notes on some Germarostes s.str. Paulian, 1982 from the cloud forests of Ecuadorian Andes with remarks on allied Ceratocanthinae genera (Coleoptera Scarabaeoidea Hybosoridae). pp. 407-416. DACCORDI M., 2008 – The species of Elytromena Motschulsky 1860, with observations on Elytrosphaera Chevrolat 1836 and related genera. (Coleoptera, Chrysomelidae, Chrysomelinae). pp. 417-463. CONSTANTIN R., 2008 – Description of a new species of Melyrodes Gorham, 1882 from Ecuador (Coleoptera, Melyridae). pp. 465-468. BELLÒ C., OSELLA G., 2008 – Two new species of Howdeniola Osella (1980) from Ecuador (Coleoptera Curculionidae Cossoninae). pp. 469-476. RIGATO F., SCUPOLA A., 2008 – Two new species of the Pyramica gundlachi-group from Ecuador (Hymenoptera Formicidae). pp. 477-481. JANNI O., BOANO G., PAVIA M., SILVANO F., 2008 – A preliminary avifaunal survey along the Rio Yanayacu-Pucate, Pacaya Samiria National Reserve, Loreto, Peru (ECOMUSA Project). pp. 483-496.